Hay House Inc., 9781401957650, 208pp. After revealing exactly how celery juice does its anti-inflammatory, alkalizing, life-changing work to provide these benefits and many more, he gives you the powerful, definitive guidelines to do your own celery juice cleanse correctly and successfully. You'll get instructions on how to make the juice, how much to drink, when to drink it, and what to expect as your body begins to detox, plus answers to FAQs such as "Is it safe to drink celery juice while pregnant or breastfeeding? ", "Is blending better than juicing? ", and "Can I take my medications with it?" Here is everything you need to know--from the original source--to receive the full gift of what Anthony calls "one of the greatest healing tonics of all time." 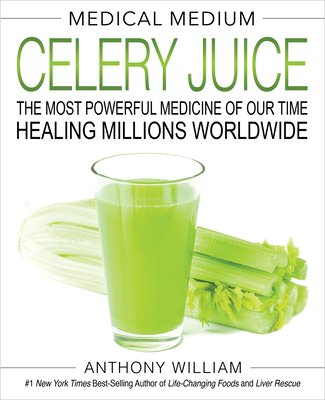 Anthony William, the originator of the global celery juice movement and #1 New York Times best-selling author of Liver Rescue, Thyroid Healing, Life-Changing Foods, and Medical Medium, was born with the unique ability to converse with the Spirit of Compassion, who provides him with extraordinarily accurate health information that's far ahead of its time. Since age four, Anthony has been using his gift to "read" people's conditions and tell them how to recover their health. His unprecedented accuracy and success rate as the Medical Medium have earned him the trust and love of millions worldwide, among them movie stars, rock stars, billionaires, professional athletes, and countless other people from all walks of life who couldn't find a way to heal until he provided them with insights from above. Anthony has also become an invaluable resource to doctors who need help solving their most difficult cases.